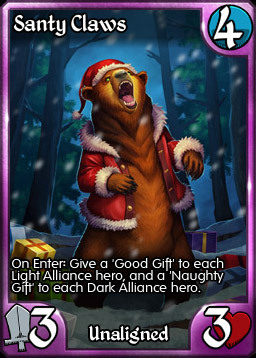 Just want to wish all of our Kingdoms CCG players a merry Christmas and a happy holidays! 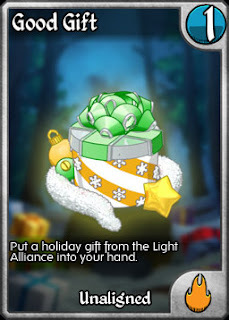 When you open (aka "cast") these gifts, a good card from your Alliance will be created in your hand. Every card is Rare or Epic and they all are useful in multiple situations regardless of deck, so no Backfires or Magnum Opus of Light. Yeah, it's random, but who doesn't like getting presents? And if you missed the announcement on Facebook, Kingdoms CCG is available NOW on Android phones and tablets! The iPad version is in the hands of Apple, so we'll have it available as soon as Apple gives us the go-ahead. Just a reminder that our mobile versions can only connect to accounts made on the device itself, dotcom, or Steam. And if you haven't done so yet, definite check out the best Kingdoms CCG card viewer and deck builder out there. xankludan has done a killer job on this, and I've (finally) sent him the rendered cards from Gods Reborn so that it can be updated. So again, have an amazing holiday, and we'll see you all in the new year! Just a quick release this morning to fix some bugs created in our previous release. 1) Chat is back working the way it is supposed to. You can now click names to pull up profiles, reply to PMs and see more than one line of text in the typing area. 2) Bothar's Crush You! now actually only does 3 damage. 3) Olfaan's Stun Shot now properly removes an ability before applying the damage. 4) Fixed a bug in the interaction between Dimensional Rip and Elara. NOTE: It appears that some of the code we've added preparing for the mobile release of Kingdoms has messed up chat. Currently you can't click a player's name to bring up their profile or reply to PMs. We are on this and will have a fix ASAP. 1) Enemy AI heroes now have a "thinking" icon. To make it clear what is happening on their turn. 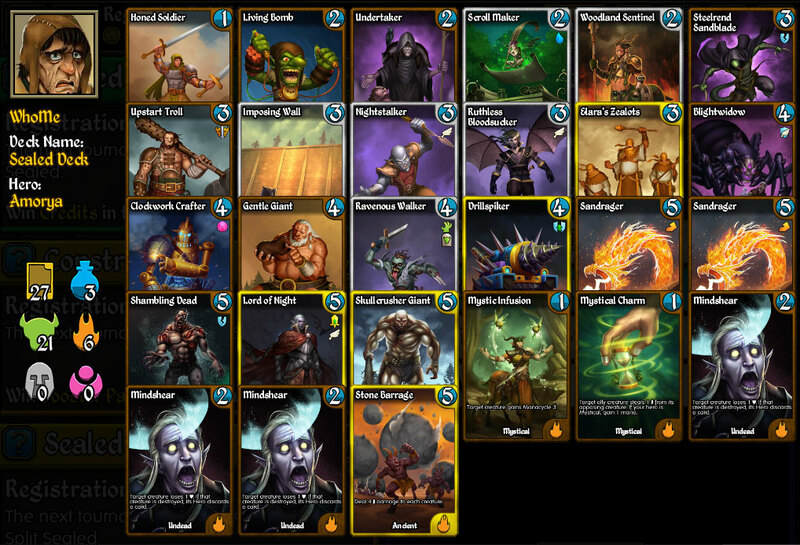 2) The Deck Builder now displays Kingdom icons for your Hero and each kingdom in your deck. 1) Thania's Step Through Time will now properly prevent charges being added when used multiple times in the same turn. 2) The ability "Support" can no longer stack. Stacking never affected the ability, but it did prevent you from getting other, more useful abilities when granted by a randomized source. 3) Queen of Dragons has her Indestructible back. 4) Big Frosted Giant now properly gives Slow to creatures that attack it. The Slow stays for the attackers next turn. 1) Mystery Sack mana cost dropped from 4 to 3. Happy Holidays! 2) Opus of Gadgetry now awards 2 charges in each ability instead of 3. For a full overview of the changes with reasoning, read the full article here. 1) ALL 15 Life/2 Mana heroes have been moved up to 16 life. Now the life/mana ratios have been balanced across all of the heroes. 2) Bothar's Wrecking Ball has been moved from 3 charges to 4. 3) Bothar's Crush You! now deals 3 damage to a creature instead of 4 and removes 2 charges from the enemy's third (aka Ultimate) ability only. 4) MEK's "Mechana War Banner" now reads "Ally creatures are +1 ATK and have Volatile. On your turn: If you control a 'Construct', draw a card. 5) Thania's Step Through Time has been moved from 7 charges to 8. 6) Noran's Polymorph has been moved from 7 charges to 6. 7) Nomad's Grand Theft has been moved from 7 charges to 6. 8) Olfaan's Stun Shot now always deals 1 damage. 9) Olfaan's Loot Corpse now always draws a card, gains 1 HP and 1 mana. 10) Olfaan's Scatter Shot now always deals 2 damage to each enemy creature and the enemy Hero. 1) The Arena will now award Gods Reborn packs instead of Descent into Darkness. 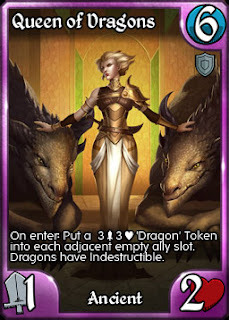 2) The card prizes have been changed to Alt-Art Queen of Dragons (top players) and Alt-Art Swiftshot Ranger (participation). These prizes will be awarded in this season and the next. 1) Tournament Prize Packs, Training Ground Reward Packs and Gem Purchase Bonus Packs may now contain Gods Reborn cards along side the other expansions. We're running a week long contest on Facebook for a very cool prize - YOUR CHOICE of Gods Reborn artwork in a custom printed poster mailed directly to your door (plus 50 gems to boot!). There are a minimum of 10 prizes to win, but if we get a lot of shares, we could increase this number! End of the Year Balance Changes! 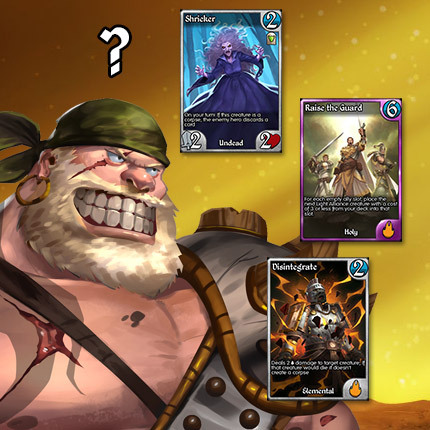 To end the year, we've made a number of balance changes to Kingdoms CCG. The goal of these changes are to expand the top tier of heroes, and reduce the gap between the top tier and bottom tier. There will always be better and worse heroes - perfect balance is impossible and would be broken each time we release a new set - but we want players to be excited to build around any of our heroes and leave room for innovation. You never know when the next top deck is just around the corner. The very muscular elephant in the room is Bothar. Bothar was an attempt to create a Standard playable Hero in an age where Ancient heroes were consider "unplayable" in that format. The change to 2K has turned that age on its head, and Bothar's kit of flexible skills has reached the top of both formats by a strong margin. We recently made a small change to Bothar, but the impact was minimal. 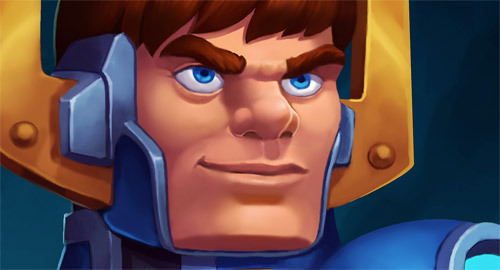 So we've decided to make more significant changes to bring him in line with the other heroes in the game. 1) Wrecking Ball has been moved from 3 charges to 4 charges. This gives decks with small creatures and support gear a bit more room to be effective. 2) Crush You! has been changed to do 3 damage instead of 4, and remove 2 charges from the enemy hero's third ability only. Bothar remains strong against gear-based decks, but becomes a little less effective against creature based strategies. By removing the randomness from the charge removal opponents can now better plan their strategies against Bothar. We feel that these changes keep Bothar powerful - among the best in the game - but should give all other heroes more game against him. 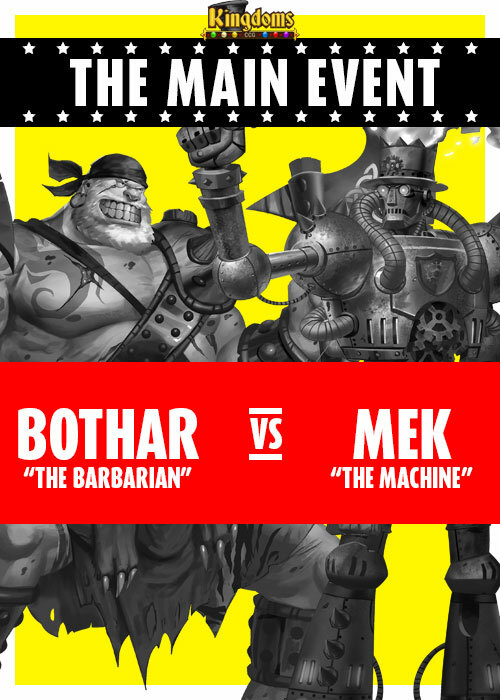 With the toning down of Bothar, the concern has been that MEK will take over, and that MEKs lower numbers are directly related to Bothar's top tier status. We agree and have proactively changed MEKs most powerful tool - the Mechana War Banner itself. Mechana War Banner now reads: Ally creatures are +1 ATK and have Volatile. On your turn: if you control a 'Construct', draw a card. Removing the bonus +1 HP for Ally creatures makes controlling MEK's forces a little easier, and changes the dynamic of the late game for MEK. While MEKs forces will be able to "trade up" easily, they'll be much less likely to remain on the battlefield after combat is done. More significant, the card draw is now conditional. As MEK creates Constructs it doesn't force players to make wholesale changes to their decks, but instead simply gives opponents a new method of controlling the number of cards MEK is drawing. Thania has avoided adjustments for almost a year, despite being a strong choice that entire time and dominant (60+% win rate) for much of that time. The time has come to make a change. Step Through Time has been moved from 7 charges to 8 charges. Arcanos has not been changed at this time, but we are watching him closely. One final reduction in power has gone to Opus of Gadgetry. This gear now grant 2 charges in each ability instead of 3. The Opus was making balancing Hero abilities difficult, with players often able to use and refill their abilities to use them again on the same turn! Opus is still very strong, particularly when used in multiples, but we do believe that this will restrain its power overall. We have also given a few heroes an added boost to try to bring them back into the metagame and again expand the range of heroes that players consider "top tier". 1) Noran's Polymorph has been moved from 7 charges back to 6. After a year with this change in place, it has become clear that Inspiration was Noran's OP ability and that Polymorph, while very strong could be reduced to give Noran some built in removal. Also, Puresoul is far more common now, so a strong counter is available. 2) Nomad's Grand Theft has been moved from 7 charges to 6. Nomad has a ton of potential, but has never been a top tier hero. My reducing the cost of his strongest ability, our goal is to make Nomad more intriguing to play and create a new challenge to the meta. Numerous redesigns of Olfaan have been discussed over the past year, but at the core of it he was never a bad hero, just completely unreliable. 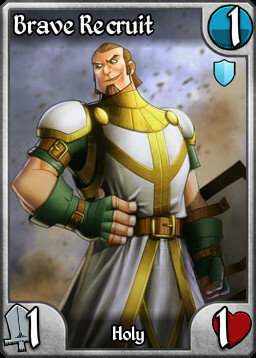 We've given him the reliability he deserves and expect that he will now be a strong aggro option for Alchemy. Finally, as mentioned in the forums ALL of the 15 Life, 2 Mana heroes have been upgraded to 16 life. This includes: Amorya, Shadow, Nomad, Petrice, Amarus, Wilrius, Olfaan, Crutomist and Alisten. 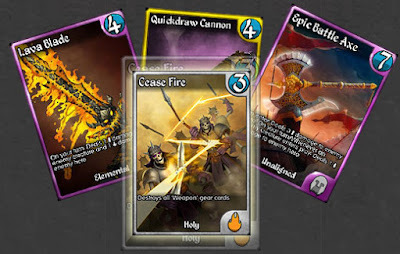 This article is an introduction to the new Limited and Standard environment of Kingdoms CCG. 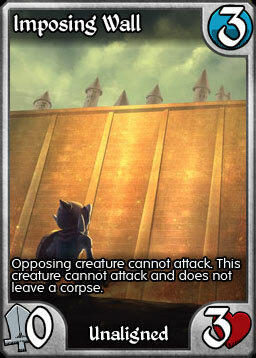 A player may build a deck between 40-60 cards using the cards from two (2) Kingdoms plus any Unaligned card. Your Hero's Kingdom counts as one of the deck's Kingdoms. For example, Jorma decks are Elemental whether or not they have Elemental cards in them. If your Hero has a Kingdom, your second Kingdom may not be the opposite Kingdom (i.e. Elemental-Mystical). 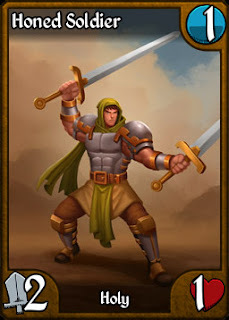 An Unaligned Hero may choose ANY two Kingdoms to build their deck, including opposite Kingdoms. And that's it. Limited still has its rarity restrictions, and Standard still has a limit of 4 Legendaries. So you want to make a Standard Devroth deck. Devroth is aligned to the Holy Kingdom, so this immediately means two things: first, your deck is Holy. You don't have a choice about this. 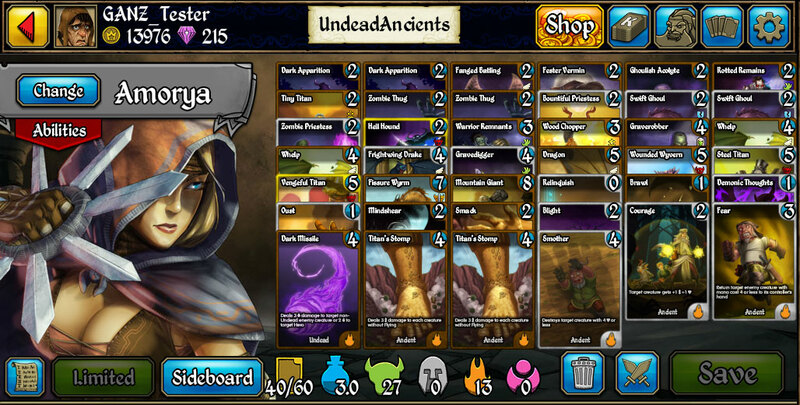 Your deck can also not include any Undead cards, as Holy and Undead are opposite kingdoms. So your decision is whether to pair Devroth with Alchemy, Ancient, Elemental or Mystical. As Devroth is built around 2 mana creatures, we need to evaluate our options in each of these Kingdoms, and the support spells that it might provide. Let's go through this. Alchemy - Alchemy doesn't have a lot of options for 2 mana creatures, but it does have the new Auto-Bot which can be an annoying threat as it just won't go away. Gnome Champion also has potential, but Devroth doesn't grant abilities, so may not be the best fit. 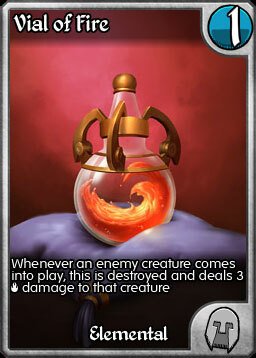 In the spell category, we have Rejuve Potion, of course, and Deploy Cannons for extra damage, but not much else. Let's pass on Alchemy. Ancient - As Ancient is built around large creatures, it only has a few options as well. That said Priestess of War is a solid 2 drop, and Keeper of Secrets can really slow down spell based decks. Ancient has a number of solid removal options, including the "get out of jail" card Echo Blast. Overall though, Ancient doesn't look like the pick. Elemental - Elemental has some great 2 drops - Swiftshot Ranger, Firesworn Elf, Furous Firehawk, plus packing a few larger haste creatures like Mindshocker and Fury Stoker is never bad. Plus Elemental has the best damage-based removal, to keep the lanes clear for Devorth's beatdown. Elemental is a strong Kingdom to pair with. Mystical - If you want to take Devroth in more of a aggro-control direction, Mystical has some great options - Dryad of the Watch, Deepwood Druid, Thoughtwoven Spirits, Woodland Sentinel. You lose the direct damage, but gain strong mana gain, Fae Charm and Flashback to close out a game. Mystical is also a strong Kingdom to pair with. And of course Unaligned has the amazing options of Dutiful Heir, Raging Vines, Erratic Werewolf and Relic Hunter... and you can play them regardless of which Kingdom you choose. Now the decision is up to you! Build the best deck and hit the Arena. As with rarity in Limited decks, the Sideboard is not checked for validating a deck. So you CAN pack cards from another Kingdom in your Sideboard. That said, you MUST replace ALL of a Kingdom to use those cards. So for example, in the Devroth case above, if the deck was 100% Holy except for 4 Disintegrates, and you had 4 Echo Blasts in the sideboard, you could swap them out 1 for 1. But at no time will a Standard or Limited deck with 3 Kingdoms be allowed in play. 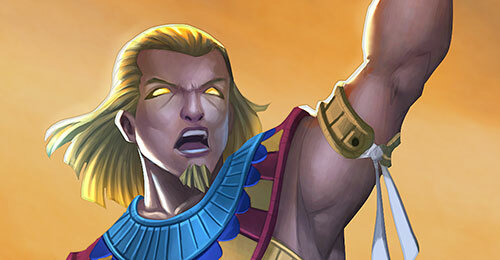 So for weeks we've been talking about Gods Reborn and the exciting new cards that it will bring to Kingdoms CCG. We've also been talking about the move to Two-Kingdom (aka 2K) Limited and Standard, which will likely be the biggest change to Kingdoms CCG in years. With this major release we have also made some significant hero changes, and changes to what is available in the store. In an effort to create more diversity in the field going into the new 2K era, we've toned down some of the top tier heroes and given some buffs to a few lesser used heroes. Note that the goal of toning down the top heroes was not to take them down to the middle, but rather move them down a little to give an overall boost to everyone else. MEK: Build An Army now produces a 2/2 Mechana Construct token creature with Volatile. The random bonus ability has been removed. 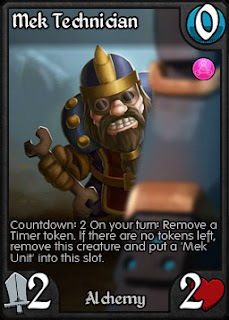 MEK is obviously one of the most powerful characters in the game, and has the ability to control a game with his abilities alone. 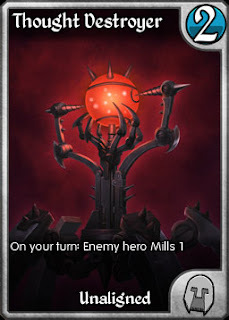 When looking at his abilities we felt that the change with the most impact would be to weaken his creature tokens, giving opponents an easier time removing them and granting more time to attack for the win while MEK sets up his wall of gear. Build an Army is now closer in line with other 4-5 charge token generators. Bothar: Surge of the Ages no longer provides 2 mana when an Ancient card is drawn. Looking back at this ability's history, it was buffed twice in Beta, in concern that it would too weak. Time has proven this logic flawed. The mana bonus honestly wasn't necessary for this ability and gave it flexibility it just didn't need. Arcanos: Blistershock now only deals 2 damage if you target a creature, and you have already played a spell. It will never deal 2 damage to a hero. When we were looking to buff Arcanos, he was languishing at the bottom of the leaderboard, unused and unsuccessful the few times he was. So we pushed him. Hard. It seems a little too hard, as Arcanos has been a lock for top 3 Hero since the change was made. Again we wanted to make a small change here that didn't remake him, but give him a little less inevitability. He remains a strong Elemental control choice. I add this not as a joke, but because I know you'll be wondering why no changes were made. 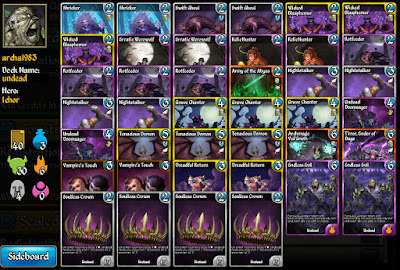 In discussions on the Beta about Thania, it was brought up that of all the top decks, Thania (and Dravkas) will be the hardest hit by the move to 2K. No matter which direction she moves - Mystical/Holy for RtG, Mystical/Ancient for removal spells or Mystical/Alchemy for charge gain - the loss of the other Kingdoms will hamper her success. This said, we are watching her like a hawk. If a change is made, Step through Time will be moved to 8 charges. Wiloryn: Dispell now reads "Target creature loses all status effects. If it is an enemy, it loses 2 abilities." Rewind now reads "Return target card with mana cost 4 or less to its controllers hand. If it is an ally, gain 1 mana." Wiloryn has long been considered a weak hero, and part of this was (A) the lack of usefulness in her abilities and (b) the fact that she actually gave benefits to the enemy. This has been changed without re-imagining her. Now Dispell has the flexibility it needs, and doesn't punish you for using it on your own guys. Rewind also just becomes a solid bounce ability with no draw back. Crutomist: When Entangle is used on a Light Alliance creature, it now also gives Immolate. Crutomist returns to his proper place as the burn specialist. As many of the top creatures are now Light Alliance, this change gives Cruto a powerful clock against creature-based strategies. Combine with Firesworn Elf and the newly released Curse of Flame to quickly stack Immolate to create "win now or lose" situations for your opponents. This is likely the most "out of left field" of the the bunch, but again has been designed to give Grovenhold new ways to build and have better synergy with his signature move, War March. Now Grovenhold can use creatures with powerful On Death abilities and get instant value as they are used to kill opposing creatures, in a sort of "pseudo-haste" fashion. And at four charges, the corpses left behind can act as cover so that a creature can be pushed through with War March. 1) Light Ascending packs are now available for Gold in the Store. 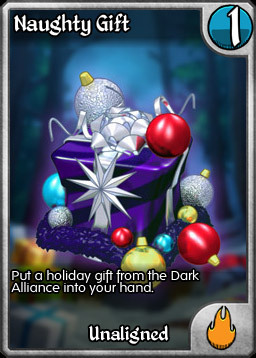 2) Descent into Darkness packs are also now available for Gold in the Store. 3) Descent into Darkness singles are now available in the Dynamic Market. We've also made another change that we think you'll be pleasantly surprised by, but we'll let you figure that one out. Finally, with the advent of 2K, we needed to rethink how we do the starting decks for our new players. We're happy to say that new account will now receive THREE fully playable decks, with a whole suite of Limited Constructed worthy cards from every set from Core to Descent. Now when a new player opens a solid Undead card, they have a deck that it can fit right into. With better decks and clearer direction on deck building, now is the best time to be a new player. So there you have it. Lots of changes and a big new set. It's a great time for Kingdoms CCG! Enjoy! 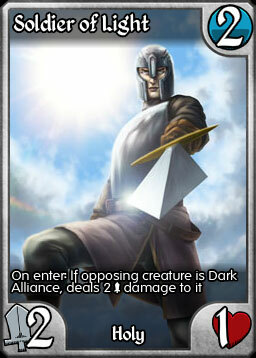 Welcome to the final card preview article for Gods Reborn. We've saved some incredible cards for last, and you'll be able to get your hands on them, and all of Gods Reborn, in just two days. That's right, Gods Reborn will be on sale on Thursday! Also in this release we will be unveiling the new "2 Kingdom" Standard and Limited formats. This will affect the current Arena season, so we hope that you've been hard at work designing your new 2K decks. Note that Guild Wars will not be moving to the new Standard at this time. Guild Wars will remain in the Legacy format for this season and next at a minimum. In addition, we're taking this time to make some hero balance changes. We will outline all of the changes in this next release tomorrow, so let's get back to the reason you're here... NEW CARDS! R'Grom, Old God was awakened by the terrible battle between Elara and T'rror and is not happy about it. Not happy at all. You will fear him. You will not control him easily. He will destroy all. R'Grom is the largest creature in the history of Kingdoms by far. At 12/12 he can kill any hero in two swings. Yet that power comes with the most epic drawback in all of Kingdoms as well. When played you lose your entire hand and all creatures you have in play. And don't think you'll just have to wait a turn before getting going again. R'Grom demands sacrifice - each turn your creatures will die, and your hand will be discarded. This is the ultimate in "All-In" strategies. If you play it right, R'Grom win you the game quickly. Play it wrong - like playing R'Grom and getting hit with a Toxic Immolizer when you don't have a hero ability to remove it... well you won't be seeing a card for 12 turns. Good luck with that. Yet if your opponent isn't prepared with a proper counter they will have few ways to neutralize this massive threat. Final Verdict does nothing. Realm Crusher does nothing. No you can't target R'Grom in any way. Yes you can throw creature in front of it to block, but that will get expensive quickly. Or you can play our next Legend. Remember in the Gods Reborn announcement where I said there will be a 2 mana card that kills Elara? What if I told you it could kill R'Grom as well, but not a simple Portly Friar? Kral is the avatar of a new age in Euna. He clears out the out Legends, and brings forth the new. 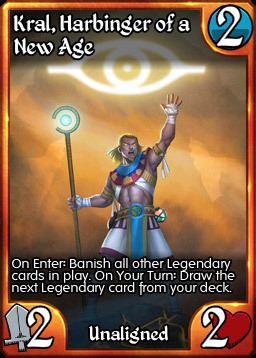 In game terms he banishes - not destroys - any Legendary card in play. This includes gear like Ayrn's Cursed Bulwark and the effect of an active Beckoning (the Beckoning card will remain in the discard pile). If he lives, he will begin drawing Legendary cards from your deck. Obviously this is a very powerful ability in Standard, but Kral has no defense - he's just a basic 2/2 creature that can be killed by a simple Firebolt. That is a lot of X's. Not clear? 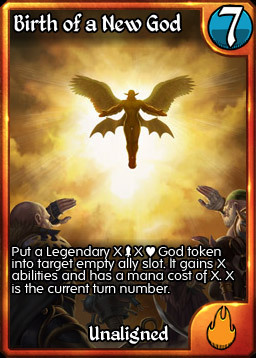 Well on turn 10, Birth of a New God will create a Legendary 10/10 'God' creature with 10 random abilities and a mana cost of 10 for just 7 mana. On turn 12 this new god will be more than will to fight R'Grom to the death. On turn 13+... you could very well win on the spot. This is much easier said that done though. Aggressive strategies can often close out a game on turn 4-6, at which point in the game Birth of a New God is only a little more powerful than a Forge-made Giant. And the investment is a heavy one. There is no way to cheat the new god into play, and if it doesn't hit Indestructible in its chosen abilities, it could quickly find itself a very pretty corpse. Finally, we have our first 3 mana Legendary, a much subtler creature who can have a massive effect on the board. Wereth, on the surface, may not seem like a Legendary creature. Perhaps not in the face of heavy hitters like R'Grom or T'rror, but get him into play and see how surprisingly powerful that a simple troll can be. When targeted with a spell or ability by either player, he throws a mini-Lightning Blast at a random enemy target. With built in Resist and Armor, Wereth can even be targeted by abilities that you would usually never consider using on your own creatures. Turn a 1 point Blistershock into 2 damage by targeting Wereth instead of the enemy hero. 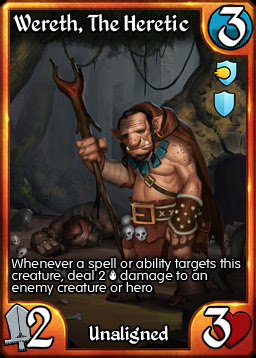 Use pump spells like Ancient's Will to create a larger troll and hit the opponent's life or creatures at the same time. When Wereth is in play every card in hand and hero ability will need to be re-evaluated. That is the stuff of Legends. These great Legendaries and 93 other new cards will be yours to discover this Thursday. 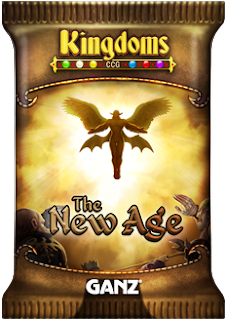 Get ready for a grand new age in Kingdoms CCG! 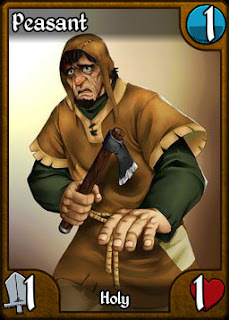 In our last preview we looked at Peasant, a 1/1 for 1 that wasn't even worth that single point of mana. Now we're going show you how a single line of rules text can turn a peasant into a powerhouse. Before we show you the card, let's take a look at the Alchemy kingdom. In the early design of Kingdoms, Alchemy could do just about anything. There are cards with life gain, charge gain, charge removal, mana acceleration, direct (though randomized) damage, the best tutors in the game and two great abilities in unblockable and volatile as well. When we took over Kingdoms, I knew that I wanted to prune down the breadth of Alchemy's options, while enhancing and spotlighting what we had left. So life gain has gone firmly to Holy and Undead, charge removal to Ancient, and mana acceleration to Mystical. One of the unique aspects of Alchemy that intrigued me was their ability to add any Ability Icon in the game, randomly. For instance while Puresoul is a Holy ability, Alchemy could end up with creatures with Puresoul through their tinkering. Tribes showed this idea in force, with cards like Underground Crown, Perpetual Machine and Prosperity. We continued this theme in Light Ascending and Descent into Darkness in cards like Forge-made Giant, Unstable Conflagulator and Tilt the Battle. In the competitive scene though, adding random abilities has not made much of an impact. The random nature and the fact that not all abilities have an immediate effect on the board has limited the play of these cards. Until now. And let that soak in a little. Get lucky on the Engine Oil and you can have a 4/4 with 3 abilities on turn 1... and two bonus charges just for fun! Note that Gnome Champion only gets a +1/+1 for each unique ability. Armor 2 or Resist 4 each only count as one ability. If he loses an ability, he loses a +1/+1 as well (so Hose Down will kill him every time). The Champ has the ability to finish games very quickly, but he is not without risks. First off you must build around his ability. Unlike a creature like Raging Vines that will grow just by the inherent nature of playing the game, Gnome Champion without cards like Engine Oil or Unstable Conflagulator is just a yellow bordered Garden Gnome. Beyond this, as you're using multiple cards to power him up, you open yourself to giving your opponent card advantage. Even a simple Rebound get set you back multiple cards, while Fae Charm can be backbreaking. In the end though, we believe the risk is worth it. Having the chance, no matter how slight, of barrelling in with a 7/7 Indestructible Overrun creature on turn 2 is just too fun not to try out. Tomorrow will be our final card preview article, when we look at the Legendary cards of Gods Reborn. Gods Reborn: May I Have a Word, Please? Rune words. 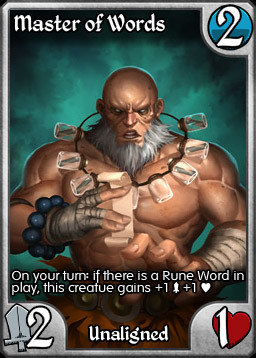 Unique to Kingdoms CCG, Rune Words affect both players with a global effect that lasts a certain number of turns. Rune Words have a perennial sideboard favorites, with cards like Silence holding back combo decks and Deny putting a damper on high value creatures. Other Rune Words, like Punish and Immortal, have been the backbone of their namesake decks and cards like Powerless and Poverty have found places in decks when the meta is ripe for the picking. In Gods Reborn we are introducing three new Rune Words that could all see constructed play. First off he have Fate. 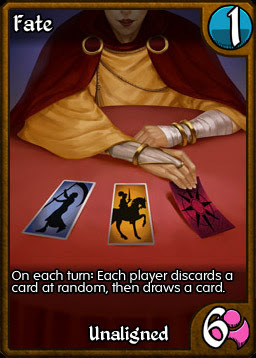 Fate quickly cycles the cards in your hand discarding one and drawing one each turn. This is a great card for filling up your own discard pile, whether it be for Dreadful Return targets, or fuel for Fury Stoker and Gob Hog Blazer. It also combos well with Mindgripper and Shuttershock Elf for an aggressive combo deck. In the Uncommon slot we have a more aggressive option... War. War isn't a subtle Rune Word, but for aggressive strategies it can push through the extra damage needed for victory. While it is a symmetrical effect, if your opponent is playing bigger, slower threats, you'll be able to get more benefit out of the card. 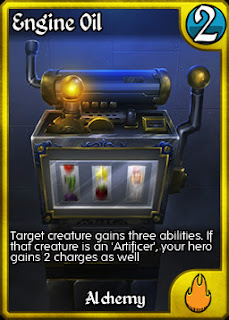 War combos particularly well with 3-slot token generators like Endless Evil and Lightning Blitz. 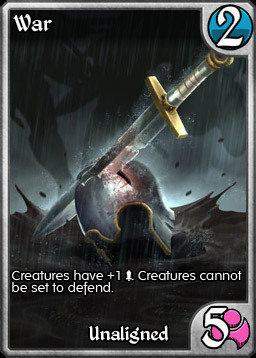 The added ability of preventing defending does not prevent players from moving their creatures around to prevent them from attacking, but that requires them to leave slots open, giving you the advantage. Finally, at rare, we have the Rune Word a lot of people have been waiting for, Rust. In the style of Silence, Recoil and Clear, Rust prevents Gear cards from being played from hand, and furthermore turns off many popular gear for the length of its timer. Deploy Cannon tokens do nothing, Mechana War Banner stops drawing cards, All the Essences in the world just sit there. Rust is the perfect sideboard card, and can be maindeck worthy in the right environment. And as we're on the topic of Rune Words, why not get some secondary value from all those cool new toys? Master of Words can grow quickly if not dealt with and has no downside. The Master also doesn't care whose Rune Word it is, so changing the current Rune Word with your own doesn't slow him down. And as an Unaligned creature, Master of Words will happily work with any Hero. Next we'll take a look at simple 1/1 for 1 mana, with no abilities and a simple line of rules text... that you will definitely want to play. Stay tuned! Here is a card that I know you all have at least one of and have likely never, ever used. Each has one more Attack and a relevant game ability... and we haven't even gotten out of Uncommon rarity! Overall, vanilla creatures and so-called french vanilla creatures (with ability icons but no game text) are a very hard sell for constructed play, as in almost every case you can find a creature with the exact same stats AND game text in the same or higher rarity. As vanilla creatures by their definition don't have any immediate board presence (other than blocking), why would you ever choose to play one? There is nothing I enjoy more than designing cards that do something completely new and unexpected. Stone of Simplicity combines two powerful effects into a single card. 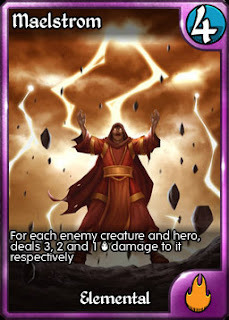 First it provides the more important half of the rune word Deny on a permanent basis, shutting down numerous cards including Arch-Mage, Fae Combatant, and Fury Stoker. These cards are particularly inefficient when they lose their On Enter - no one want to pay 6 mana for a 1/2. 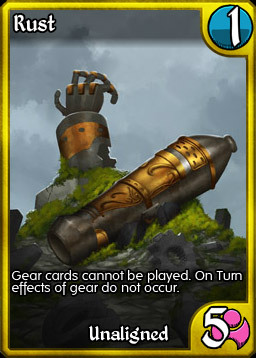 While this effect on a gear was a popular request in the forums, and will see the card appear in decks just for that purpose, it is the second part of the card that I'm most proud of. Never before has being a vanilla creature been a positive for a card. Suddenly Brave Recruit becomes a 2/2 with Armor for 1 mana. A simple Black Bear becomes a 3/3 for 2 mana, and Runed Kermode becomes a beastly 4/4 with Resist for 4 mana. All stat lines we'd never print without a hefty penalty. Note that the card does not say "non-Token," nor does it say "Ally." Yes, the Stone affects both player's creatures, and it does affect Tokens. 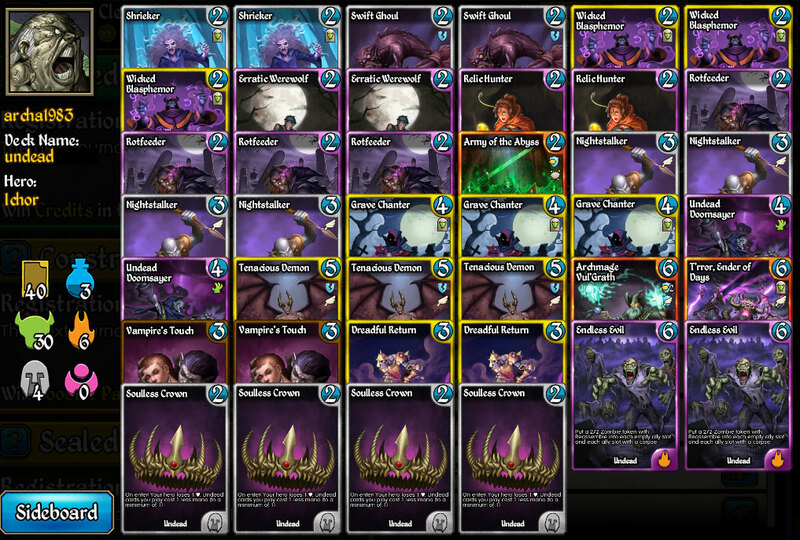 Abaddon, with his strong Reassemble theme, may be tempted to join sides with the Ancients to make his zombies and skeletons extra powerful, while dropping 4/4 Angels could finally push Akatril into the limelight. Stone of Simplicity is definitely a "build around me" card that could see rise to some powerful decks using the most basic of cards. And I know what you're thinking, "Nice card, but you actually think it will make me consider playing a common, vanilla 1 drop?" Yes. 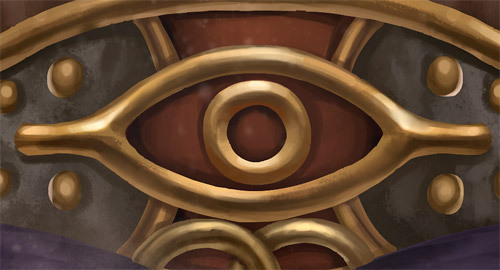 Gods Reborn is almost here and this week we'll be posting a new card preview each day to show you what's in store in this exciting new set. 1) Expand the canon of Euna to include some new races from "beyond the shores" of the island that we've known so far. 2) Create new tribal deck opportunities. 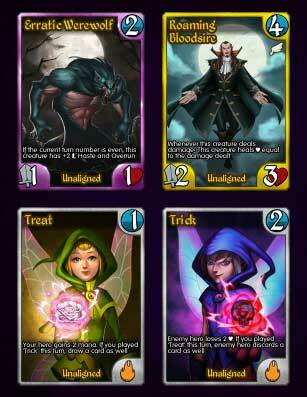 3) Try out some new abilities and card text that had never been done before. 4) Create some cards that scream "build around me" for top deck builders. 5) Create answers to some of the gaps in the metagame. Today's card falls squarely in this last arena. Over the last few sets we have seen the rise of some very powerful gear: Essences, Opuses, Inverted Hourglass, Epic Battle Axe. The rise of MEK, as discussed here, has brought gear front and centre in the meta, leaving players seeking new solutions to these problems. 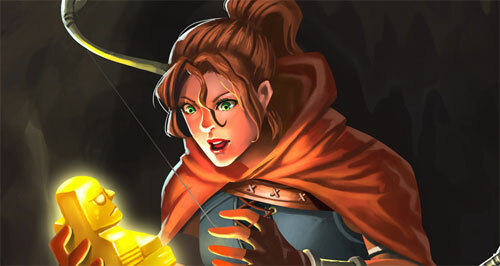 Earlier in the life of Kingdoms, Weapons were the biggest issue that players had to face. Lava Blade and Quickdraw Cannon were everywhere, controlling creatures and winning games on their own. Tribes added Epic Battle Axe to this list, but also brought the ultimate solution to the weapon problem: Cease Fire. While that helped control Weapons, the new and powerful Relics have gotten off pretty easy. There is no mass Relic destruction, so the risks of going all-in on Relics has been enticing. This strategy may need some rethinking come Gods Reborn. Introducing: Relic Hunter. Oh, that is a nice Hourglass, may I have it? How about I fly that Mechana War Banner? Sometimes the best solution isn't just to break things, its to take them and make them your own. 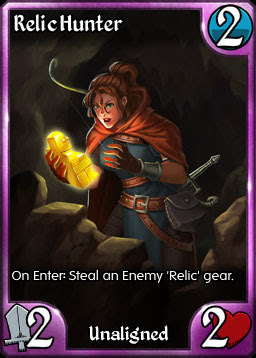 Relic Hunter fits into any Standard deck and for just two mana can swing a game 180 degrees. Her effect is random, so players can try to outwit her by playing multiple Relics at once, but requires players to play around her. Drop a Relic on its own and you could easily be staring at it on the other side of the board. We expect to see our lovely hunter on many a battlefield very soon. Come back tomorrow when we discover why sometimes simple is better. As discussed in our last blog post, we've made some key changes to Kingdoms CCG. 1) Scavenging Goblin now steals charges on combat damage only. 2) Haste has changed. If Haste is removed prior to attacking on a creature's first turn in play, the creature will not attack. 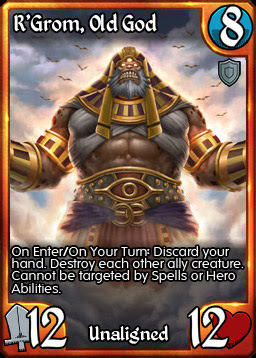 Currently this only affects Empower, but there are multiple cards in Gods Reborn that are affected. Wars are only 15 battles long. Faster wars = less fatigue. Gold rewards, including losses, have been increased. The 8th place Guild in Epic now receives a Gem reward at the end of the season. Now only the top 2/bottom 2 guilds will move after a season. Note: This is the first time that we've adjusted the Guilds system. It is one of the most complicated parts of the game, and we have hundreds of guilds, something that we cannot simulate in our development environment. For this reason there may be issues with these changes. 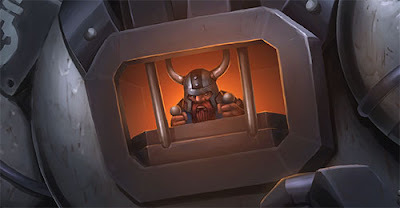 Our testing has not shown these, and the reduced wars/increased payout are definitely working, but we do want you to know that there is a chance that we will have troubles at the end of the current season. We will be watching it closely. In particular, we're not sure if the increased League sizes will come into effect. It is coming up on a year since Ganz took over the reigns of Kingdoms CCG and the game has changed a ton - seven new heroes, two new card sets, robust Arena play and an improved early game for new players. While I'll save my own review of the past year for a future post, I want to share with you what we are working on now, and what we will be working on in the future. We've got some major changes upcoming and we want you to be prepared. These changes will occur prior to the release of Gods Reborn, likely next week. I put the question of changing Scavenging Goblin to work on combat only damage to the community and the response was overwhelmingly "yes". So as of our next release, the dreaded Concealed Dagger/Scavenging Goblin combo will no longer work. No other changes are being made to Scavenging Goblin. You'll still be able to give Goblin haste, or take an extra turn and swing in, but the days of the six-mana "Deal 1 damage, steal all charges" will be over. Haste is changing. As of the next release creatures that lose haste for any reason prior to attacking on the turn they are played will no longer attack. In technical terms, we're now checking for the presence of haste, and the turn that the creature came into play, prior to battle. Currently, this really only impacts the Empower combo, which isn't even commonly played, but that's not the point. By making this change we're able to open up new design space without having balance issues. 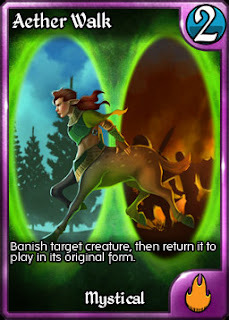 There are now two creatures in Gods Reborn with conditional haste, and a new "use abilities to win" card that I know players will build around. The change also just makes sense. In no other trading card game that has haste (and they almost all do) can a creature attack if they lose the ability before attacking. Having it different for our game is confusing to new players and doesn't even make sense with the ability's description. 1) Each War will be reduced from 30 to 15 battles. 2) The amount of Gold made by winning a battle will be increased. 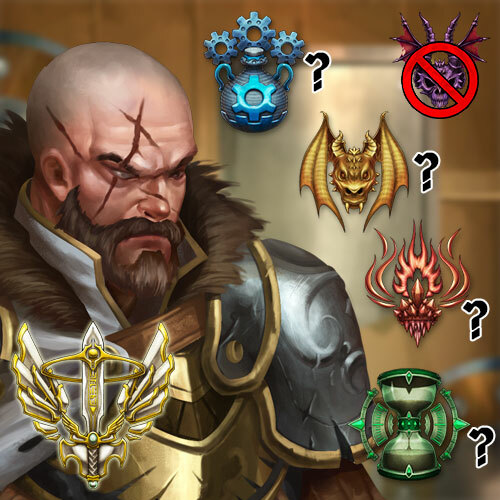 3) The amount of guilds in Silver and Gold leagues will be increased. This will allow for more players to enjoy a higher level of competitive play. 4) We may decrease the number of guilds that change leagues at the end of each season. What I'd really like is to make it so guilds can actually choose the league they're in and when they move, but that is a longer term goal. Note: we've never made this sort of change to the Guild Wars system before, and cannot 100% test this in our local environment, so it might be bumpy. We're not making any major code changes so it should run smoothly, but we do want players to know that interrupts may occur. 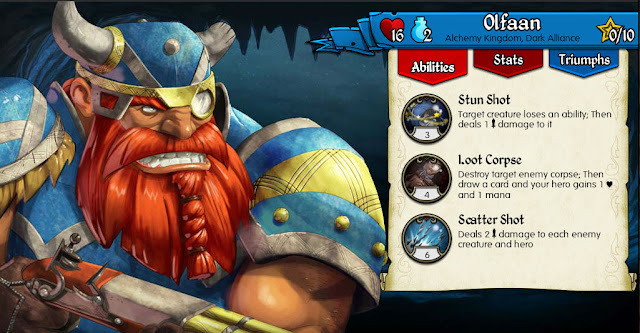 Other than Gods Reborn, the largest project that we're working on is a new mobile version of Kingdoms CCG. This version will be released on iOS first, but we will follow quickly with a version for Android devices. The most important change is that our mobile version of the game will be completely integrated into the existing game. So every new mobile player will be new competition wherever you play from. Steam and kingdomsccg.com players will also be able to log into their current account on their mobile device. We're in discussions with Kongregate to see if we can offer the same to our many loyal Kong players. Finally, as the mobile version uses the same servers as the main game, updates will be lock step with the web version. If its online, it'll be on mobile! In the early days of Kingdoms CCG, when the Limited and Standard formats were created, it was decided that decks could contain any card that wasn't part of its direct enemy's kingdom. So Elemental decks could play any card except for Mystical cards, Ancient couldn't play Alchemy and so on. Unaligned heroes, as a result, could play any card they wanted. No restrictions whatsoever. The problem with this system is that it means that Kingdoms are defined by what they are NOT, not what they ARE. Ancient is defined as "not being able to play Rejuve Potion," not "being able to play Echo Blast". Wanting to play Rejuve Potion doesn't encourage you to play Alchemy, it encourages you not to play Ancient. The result is that Heroes become far more relevant than the Kingdoms they represent. Card balance becomes extremely difficult and the baseline for deck design becomes stagnant. This simply isn't good design, and it isn't good for the long term health of the game. 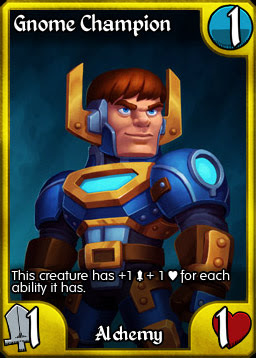 The game is called "Kingdoms CCG" not "Heroes CCG" - Kingdoms must be relevant. With the release of Gods Reborn we will be changing how deck building works in the Standard and Limited formats. Standard and Limited players will now need to build their decks with two kingdoms. The Kingdom of their Hero, and a kingdom of their choice (excluding the opposing kingdom), plus any unaligned card. 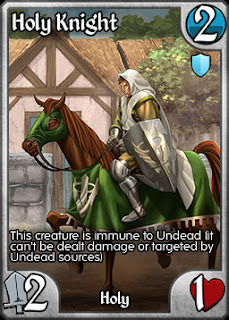 Unaligned Heroes will get to choose any two Kingdoms, so if you really want to combine Holy and Undead cards you'll still be able to. 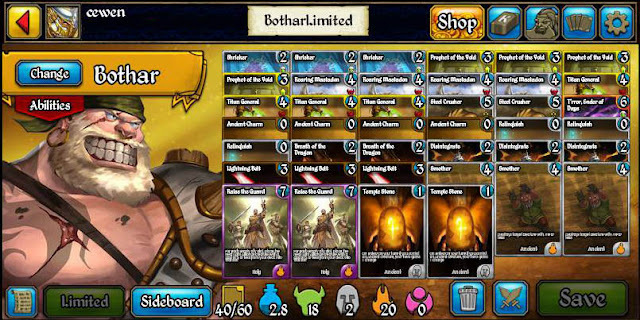 Recently we looked at Cewen's Limited Bothar deck. While mostly Ancient, it used a Holy card for its combo, elemental cards for removal, and an Undead 2-drop to avoid Raise the Guard. Now he will need to decide - what is most important? Holy, Elemental or Undead? To stay with the combo, Cewen would need to go Ancient/Holy, sacrificing his removal package. He'd also have to remove his 2 mana creatures entirely, so not to have them grabbed by Raise the Guard. Or perhaps he drops the combo and goes Ancient/Elemental, replacing Shrieker with Swiftshot Rangers. These are the kinds of discussions we want players to be having. This format was played by our Beta testers during the testing of Bothar, MEK and Felincia and the response was largely positive. There was some concern that players would need to adjust every deck they have (this is true) but the feeling was the result was worth it. Naturally we know that players who love their current Standard decks will want to keep playing them. For these players we will be creating a new format, called Legacy, which will continue to use the current rule set. Legacy will be supported in Tournament play and may appear from time to time in the Arena. We do want to hear from you on this change. Please post your comments/questions in this forum thread. Recently we ran two surveys - one for our regular players, and another for players who used to play but haven't played recently. In both cases the number one requested improvement for Kingdoms CCG was MAKE MORE CAMPAIGN (and said that loudly as well). We hear you. While this request is not new, we never knew exactly how important was to our fans. Now we do. Furthermore, we've discovered that even amongst regular players and veterans, 47% of players actually prefer playing against the AI. We will now start expanding the campaign, with the goal of completing the map. This will be done over the course of a number of releases - one section of the map at a time. Yes, we will have new enemies to fight and new promo cards to unlock. We will also continue to improve the existing Training Grounds. We'll be doing this by adding more variety to the decks played by the AI, smoothing out the difficulty and reducing the number of battles needed to pass a node. We hope to have the first expansion ready by Christmas. We're definitely not happy with how Tournaments have been designed. There should never be a point where you can go to the Tournaments section and not have a Tournament to enter. You should also know how many players are waiting for a tournament to start, and - crazy thought - every tournament should actually start. We have planned out and designed a completely new Tournament System. This system will have on-demand tournaments. As soon as a tournament fills at 4 or 8 players (depending on the event) it will begin and another tournament will open. Formats will rotate weekly, so you'll know what is available before you even log in. We currently don't have a timeline for this feature, but it is very important to us, and we hope to have it in place by early 2016. First off, thank you for reading all the way to the end. There was a lot to get through, but we hope that it was worth it. It's a Lightning Bolt for 1 mana! Sort of. Your opponent will get to choose which creature takes the damage, but it will definitely put a road block on their plans. In a meta of small creatures, a few vials will go a long way. Note that playing multiples may not always be a good idea, as they will all trigger on a single creature entering play. Great for blowing up Elara, but not so great against a 1/1. Agin, we'd love to hear your thoughts on any or all of the changes listed here. Join the conversation in our forum. Another PVP season has come to a close and the story of the season was clearly the rise of Bothar vs. MEK. In the Standard Top 100, MEK was the most used hero, and Bothar came in at number 4, behind the reigning champions Arcanos and Thania. Both MEK and Bothar sported a 53% win ratio, which while good, is nothing spectacular (both Uunys and Devroth had the same win ratio). Where the two really had an impact was Limited. In the Limited Top 100, Bothar has solidified himself in the top spot, appearing in 31% of games and had a win ratio of 68%. Who did Bothar prey on? MEK. While MEK was running around giving aggressive decks a fit, Bothar was primed and ready to punish these players. The most successful Bothar deck was run by the winner of this season's Limited Ladder, the Ancient kingdom's biggest proponent: Cewen. Cewen worked to lock opponents out with the combo of Raise the Guard and Prophet of the Void. With so many decks relying on inexpensive cards to keep up pressure, opponents could find themselves sitting watching as the Prophets grew under Surge of the Ages with few options to fight back. And if one Prophet could be removed, Titan General is happy to join the party and make the Prophets even bigger. 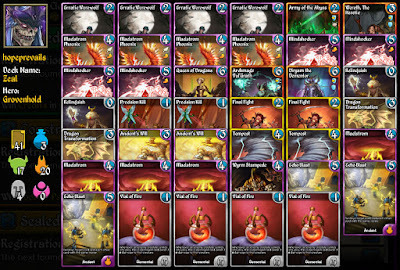 I spoke to Cewen after the season and he feels that this deck is the best Limited has to offer, with so few immediate answers to a wall of Prophets (T'rror, Realm Crusher, Echo Blast, Divine Wrath). 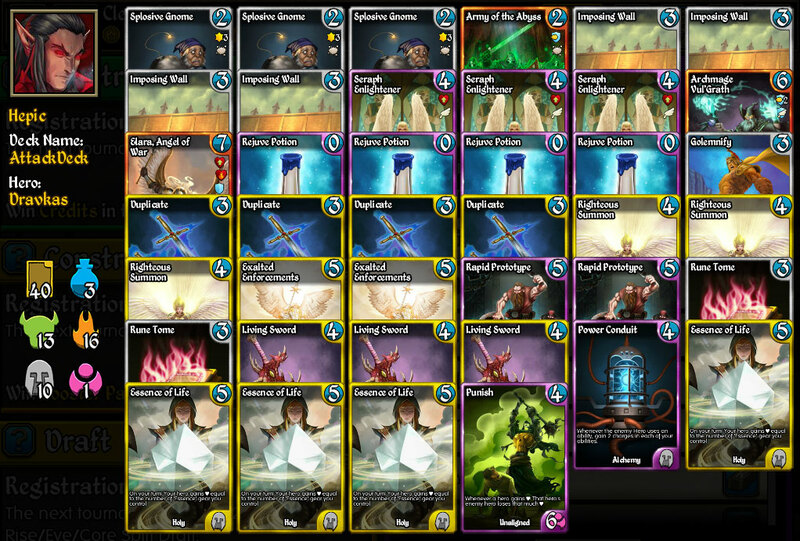 In his view, the deck is weakest against Arcanos spell-spam decks and other well-built Bothar decks. Are we concerned about the rise of Bothar and MEK? Not yet, but we will of course be watching over the next season and the release of Gods Reborn to see how the meta responds to this new threat (as well as continuing to watch Arcanos and Thania). 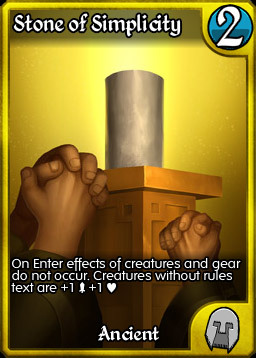 Originally intended as a prize card, and inadvertently teased in the promo section of the collection, the Staff of Stability has been moved to the booster set so that everyone can get it. 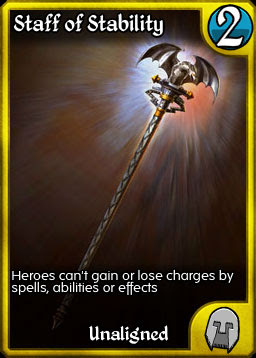 And in an era of very strong charge based builds, it could have a significant impact on the metagame. 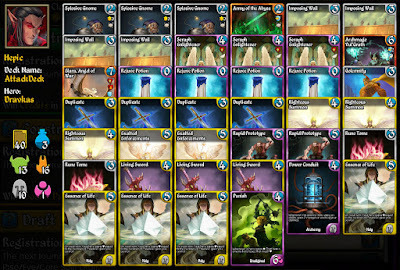 Just look at Cewen's Bothar deck above. Staff shuts off 11 cards. Versus the MEK decks that run Charge Orb and Charge Potion it has even more of an effect, and of course it blanks Goblin Scavenger completely. For Heroes that have low charge costs like Shadow and Felincia, the Staff can help them compete against more powerful ultimates and give them time to seal victory. Note that Staff does not prevent the three charges gained at the start of each turn, it just forces players to play the charge game fairly. Just a quick update today to make a couple of small fixes, and put the Spooky Bundle back on sale! Do you see it? Roaming Bloodsire has had its cost reduced to 4 mana. 5 mana for a 2/3 just was too much for such a situational ability, and with Gods Reborn bringing some very interesting toys for the Vampire tribe, we decided it was time to give the original Kingdoms CCG vampire a boost. The bundle will be on sale until November 1st, and includes 50 Gems along with the cards for just $10 (USD). We've also fixed Realm Champion and Eternal Dragon. They're back to their indestructible glory. First off I want to say thank you to everyone who has answered our survey. The feedback has been great. In regards to the 20 Gems, we're going to start handing them out tomorrow. We will be doing this by hand, so it might take a couple of days to get yours, but rest assured that everyone who gave us their in-game name WILL get their Gems.